We’d love your help. Let us know what’s wrong with this preview of Unholy Business by Nina Burleigh. In 2002, an ancient limestone box called the James Ossuary was trumpeted on the world's front pages as the first material evidence of the existence of Jesus Christ. Today it is exhibit number one in a forgery trial involving millions of dollars worth of high-end, Biblical era relics, some of which literally re-wrote Near Eastern history and which could lead to the incarcer In 2002, an ancient limestone box called the James Ossuary was trumpeted on the world's front pages as the first material evidence of the existence of Jesus Christ. Today it is exhibit number one in a forgery trial involving millions of dollars worth of high-end, Biblical era relics, some of which literally re-wrote Near Eastern history and which could lead to the incarceration of some very wealthy men and embarrass major international institutions, including the British Museum and Sotheby's. To ask other readers questions about Unholy Business, please sign up. Though Unholy Business has the potential to be a riveting read, it falls far short with its disjointed approach to storytelling. The author bounces back and forth through time and introduces a dizzying array of similarly named characters in the process. In the beginning, I found myself flipping back to previous chapters just to track the chain of events and people involved. The complicated story of this massive fraud often seemed to take a back seat to the author's opinion of the reasons behind Though Unholy Business has the potential to be a riveting read, it falls far short with its disjointed approach to storytelling. The author bounces back and forth through time and introduces a dizzying array of similarly named characters in the process. In the beginning, I found myself flipping back to previous chapters just to track the chain of events and people involved. The complicated story of this massive fraud often seemed to take a back seat to the author's opinion of the reasons behind the fraud which made for a much less compelling narrative. In November 2002, an ancient carved limestone burial box designed to hold the disarticulated skeleton of a dead person was put on public display in Canada’s Royal Ontario Museum. Although common throughout Israel, this particular box, known as an ossuary, was unusual because it was inscribed. Even more remarkable, its ancient Aramaic inscription — “Ya’akov bar Yosef akhui di Yeshua” — translated to read, “James, son of Joseph, brother of Jesus.” This sent waves of hysteria through the Christian and Jewish communities, causing tens of thousands of faithful to mob the museum. But even before the ossuary was publicly displayed, experts declared the inscription to be a fraud. Unfazed by facts, the religious preferred to believe it was real. 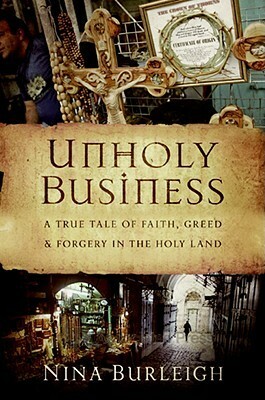 In Unholy Business: A True Tale of Faith, Greed and Forgery in the Holy Land (NYC: Collins; 2008), the author, Nina Burleigh, uncovers the trail followed by forged biblical antiquities, from illegal excavations in Israel to a world-class museum in Canada. In this book, Burleigh follows three forged artifacts; the James Ossuary, the Joash Tablet and a small carved ivory pomegranate (presumably an ornament for a small scepter used by priests in the mythical First Temple). But these intriguing objects fade to insignificance in the first half of the book. Instead, the author focuses on a varied cast of colorful characters involved with biblical antiquities — millionaire collectors, police, dealers, grave robbers, the devout and a variety of scholars. The book also provides a “reader’s digest” overview to the history of the area and the religions spawned there, but includes little depth. By the second half of the book, some of the scientific evidence is briefly presented and it becomes obvious that the James Ossuary and the Joash Tablet are only the most famous hoaxes. In fact, museum shelves and display cases worldwide probably publicly display fake biblical antiquities to this very day. The author presents this curious mix of science and mythology since it is the devout — those who accept the existence of Jesus on faith — who are most enthusiastic in their search to bolster any doubts with physical “proof” of his existence. I was disappointed by the book’s complete lack of pictures, maps and diagrams, all of which would have added much to the story. But Burleigh tries valiantly to compensate with painstaking details of the personal habits (we learn that one person whom she interviewed drinks Nescafe coffee nearly constantly), manner of dress (often comparing people or their clothing style to Indiana Jones) and physical appearances (one person was described — repeatedly — as being “bullet-shaped”) for all the characters in this story, even minor characters that are mentioned only once. Amusing, but often distracting — why such intense attention to such trivial details? This book often reads like a journalist’s diary instead of a rigorous expose, but it does tell a compelling, although sometimes convoluted, story. It would have benefited from a careful editing since a few factual errors and repetitions slipped in, as well as some misspellings and strange typographical errors where, for example, all the words in a phrase where squashed together without appropriate spacing. But overall, this book is relatively light and is a fast read, serving as an interesting but brief introduction into the excavation of ancient artifacts in Israel, the modern biblical antiquities market and the history of the Holy Land. Burleigh’s book also raises important questions about the limits of faith and science in understanding human history and the material world. This book tackles the difficult topic of biblical antiquities, forgeries, and deceit. It follows the trail of a man named Oded Golan as he sells artifacts for astonishing prices, is accused of forgery and deception, and is ultimately placed on trial. Along the way, the author interviews numerous scholars and others who figure into the investigation and trial. She provides fascinating detail about how antiquities come into the market, how difficult it is determine where any given item originated This book tackles the difficult topic of biblical antiquities, forgeries, and deceit. It follows the trail of a man named Oded Golan as he sells artifacts for astonishing prices, is accused of forgery and deception, and is ultimately placed on trial. Along the way, the author interviews numerous scholars and others who figure into the investigation and trial. She provides fascinating detail about how antiquities come into the market, how difficult it is determine where any given item originated from, and how the turmoil between Israelis and Palestinians plays a key part in the handling of such antiquities. It's a question that figures not only into science, but also into national identity and religious faith. While I found the subject matter thrilling and fascinating, I was highly disappointed in the author's approach. One would hope that when dealing with such sensitive topics as the religious belief system of millions of people, she would at least endeavor to speak with respect (despite the fact that she herself is non-religious). Yet throughout the book she consistently pokes fun at "the faithful," accuses them of bad science and clouded judgment, and asserts that religious scientists cannot be trusted. A couple of examples: in the conclusion of the book, she states that "no amount of science will persuade faith-based people, and the fact that scientists will try to do so by examining artifacts with high-powered microscopes only further alienates the believers from modernity." At another point in the book, she pokes fun at some women bent over "a stone slab said to have been used to prepare Christ's body for burial. They made for an interesting sight from the rear, with their knees under their chests and butts high in the air..." She quotes one scholar as saying that "in the Bible, there are various accounts of temple building and repairs and this [tablet] has resonances of all of them. That's one sign that it is a fake." This is a sentiment the author seems to agree with--if it seems to agree with the biblical account it's probably a fake. Although she condescendingly dismisses the biblical account, she nevertheless gets some biblical details wrong. For example she sums up a tour guides talk with the observation that "in her talk, she included the added flourish that thieves broke Christ's legs to quicken his collapse and end his suffering." Either the tour guide got it wrong (which is unlikely, since the many religious people in her group would undoubtedly have protested such a glaring error), or the author herself didn't take the trouble to get her facts straight. Either way, its poor journalism to write a book debunking biblical authority while failing to quote the Bible accurately. I learned and was reminded of several things while reading this book. 1) Everyone approaches the subject of biblical antiquities with preconceived ideas. Religious people aren't the only ones being influenced by their worldview. 2) So much contamination of dig sites has occurred (a fact discussed in great length) that it's difficult to say with any certainty where a given item originated. 3) As the author points out, many mistakes have been made. Solomon's temple may or may not have been built at one of several different sites. 4) As a Christian, I don't look to archaeology to prove the Bible. The fact that a particular artifact is proved to be a fake doesn't shake my faith at all. Nor should it. 5) Christians must be careful not to place too much emphasis on archaeology to validate their teaching. Because archaeology is so inexact, Christians set themselves up for ridicule and derision when they use an item like the tablet that supposedly came from King Solomon's temple with gold melted into it and everything! to prove the Bible. The artifact was later determined to be fake. I don't know, this was an odd book. Maybe because Burleigh is a journalist? She's trying to write a captivating, exciting story about the underground artifact trade, but I don't know that she's going about it the right way. She skips back and forth in time, so that I don't feel I have a clear picture of who saw the artifact when and what the chain of events was--even though the chapters are ostensibly organized by date, I didn't get a sense of that as I read, and I'm only seeing now that most ch I don't know, this was an odd book. Maybe because Burleigh is a journalist? She's trying to write a captivating, exciting story about the underground artifact trade, but I don't know that she's going about it the right way. She skips back and forth in time, so that I don't feel I have a clear picture of who saw the artifact when and what the chain of events was--even though the chapters are ostensibly organized by date, I didn't get a sense of that as I read, and I'm only seeing now that most chapters are labeled by date. The skips in time don't help her, either--she'll describe her own visit to interview a scholar, but then won't come back around to that scholar again for another 50 pages, when we've forgotten the name of this person and we don't connect that lady with all the cats to the person whose opinion on the artifact is being cited. Burleigh also seems to want to write this as "creative nonfiction" rather than journalism--in one chapter, Burleigh gives a three-page account of getting stuck in traffic in Jerusalem in 2007, which is completely unrelated to anything else that happened in the chapter. Burleigh is trying to make the point that everything in the city hinges on the religious life (which was in an uproar at the time, hence the traffic), but she makes that point repeatedly elsewhere in the book. I was thinking that the chapter would then go on to talk about who she saw or talked to on that 2007 trip, but no. The logic she uses to connect her narrative together is thin. I'm not saying she didn't do exhaustive research, but she just doesn't seem to present it well in a cohesive narrative. Burleigh would have been better served to have written this in a more scholarly format, I think. A chapter specifically on the patina controversy, for example, contrasting the differing viewpoints, rather than having that information scattered about in her various interviews with the scholars. Even if Burleigh had just pulled her own perspective out more, it might have been a better book--the time skipping confusion, I think, is caused by the fact that she's interviewing people in 2007, which I as the reader do not need to know at all to understand the story, but it's in there. Her physical descriptions of the people were kind of interesting, but I'm not going to remember later which lady had the cats and which guy looked like the monopoly banker. As it was, the book seemed like an uncomfortable mesh of 3rd person objective journalism with some 1st person subjective narrative thrown in, and I don't think the material warranted that. Also, I am a bit confused by the fact that she wrote this book before the Israeli court case about the forgery had been concluded. The ending seemed a bit rushed, because the end hadn't happened yet. Why not wait a few years until you actually have a conclusion? What's a museum curator to do? If items aren't found by archaeologists in a sanctioned dig, but are so deliciously historic that they turn whole religions on their heads, can the items be bought and displayed? To whom do these items belong? The country where they were found or the person or group who dug them up? Collectors don't have the same restraint. Some, like the ones mentioned in Burleigh's absorbing new book, go by feel, buying the objects of their obsession. In the process they spend va What's a museum curator to do? If items aren't found by archaeologists in a sanctioned dig, but are so deliciously historic that they turn whole religions on their heads, can the items be bought and displayed? To whom do these items belong? The country where they were found or the person or group who dug them up? Collectors don't have the same restraint. Some, like the ones mentioned in Burleigh's absorbing new book, go by feel, buying the objects of their obsession. In the process they spend vast amounts of money, encourage illegal digging, and get duped by forgers. These questions have been dogging internationally-known museums recently. Some, like the Metropolitan Museum of Art, have had to return looted items, like the Euphronios krater, to the country or origin. Others, like the J. Paul Getty Museum, have seen their staff (Marion True, former antiquities curator) on trial for years. If museums and scholars ignored antiquities that appear on the market without provenance (known and documented origin) then the Dead Sea Scrolls might never have been studied. But there is another wrinkle that haunts both the world's cultural institutions and collectors and that's the subject of Burleigh's book. Sometimes, it seems, the most tantalizing items are fake, made by skilled craftspeople to garner huge excitement and fabulous prices. Two of the items focused on in the book had international news feeds buzzing and garnered devotees in Christian and Jewish communities. The James Ossuary, a burial box complete with bones, was inscribed to imply that the occupant was the brother of Jesus Christ. If real, it would have been material proof of the existence of Jesus. Burleigh takes readers on an thrilling ride through apartments crammed with antiquities, into the workshops of scholars who are called upon to write opinions on the veracity of items brought to them, and into the international antiquities market, both legal and illegal. She had amazing access to police investigations, collectors, dealers, and academics. Oded Golan became interested in archaeology when he found a piece of ancient pottery. He sent a letter to a prominent archaeologist of the time who came to see the piece and was surprised to find not only that it was discovered by a 10 year-old boy but that it was actually cuneiform, a type of ancient dictionary. In a nation where hunting for artifacts is a national pastime, Golan eventually became a well-known collector of antiquities. He was responsible for several items of extreme significanc Oded Golan became interested in archaeology when he found a piece of ancient pottery. He sent a letter to a prominent archaeologist of the time who came to see the piece and was surprised to find not only that it was discovered by a 10 year-old boy but that it was actually cuneiform, a type of ancient dictionary. In a nation where hunting for artifacts is a national pastime, Golan eventually became a well-known collector of antiquities. He was responsible for several items of extreme significance, particularly the James Ossuary, purportedly a box that once contained the bones of James, the brother of Jesus. Unfortunately, it appears likely that Golan fabricated all his major finds, modifying actual ancient items to appear like they had historical or religious significance. This book looks into the business behind ancient relics from a land holy to three major religions - Judaism, Islam, and Christianity. Each has it's own reasons for an interest in archaeology, but these reasons lend themselves to certain abuses and gullibilities. The Christians are generally seeking to prove historically that Christ existed; the Jews are trying to establish their presence in the land as far back as possible; and the Palestinians are split between trying to erase any Jewish history and trying to make a living off those eager for their own piece of the holy land. So, most of the digging isn't official or sanctioned, but done by profiteers, which clashes with scholarly archaeologists. And it's estimated that 90% of the items being sold are actually fake. Not worth the effort, which was a surprise given that I liked the previous Burleigh book that I read (The Stranger and the Statesman: James Smithson, John Quincy Adams, and the Making of America's Greatest Museum: The Smithsonian), I enjoy books describing art fraud, have more than a passing familiarity with Biblical history, and I have had a questions since the revelation of the James Ossuary about its history and why it so quickly disappeared from view. So imagine the disappointment as I dove i Not worth the effort, which was a surprise given that I liked the previous Burleigh book that I read (The Stranger and the Statesman: James Smithson, John Quincy Adams, and the Making of America's Greatest Museum: The Smithsonian), I enjoy books describing art fraud, have more than a passing familiarity with Biblical history, and I have had a questions since the revelation of the James Ossuary about its history and why it so quickly disappeared from view. So imagine the disappointment as I dove into this book and discovered that this is a book about the people in the biblical antiquities trade, and not really about the trade itself. That disappointment was compounded when I dragged through most of the book, which is a collection of incomplete and haphazardly arranged biographies, and found that Burleigh was still introducing new characters, and that more biographic sketching was on its way. I finally put the book down with a few chapters to go because I sensed that I already had all the interest I was going to get out of it. Nina Burleigh gives us a story within a story in "Unholy Business." The shell, or outer story, is the trade in fraudulent and illicit genuine antiquities, with her focus being on the fraudulent ones. That's the first "f" - the "forgery." It's quickly united with "faith" and "fundamentalism." Fundamentalist and conservative evangelical non-fundamentalist Protestants, after centuries of their forefathers skewering the Catholic hankering for relics, are shown to be roundly hoist by their own petard. Nina Burleigh gives us a story within a story in "Unholy Business." The shell, or outer story, is the trade in fraudulent and illicit genuine antiquities, with her focus being on the fraudulent ones. It's quickly united with "faith" and "fundamentalism." Fundamentalist and conservative evangelical non-fundamentalist Protestants, after centuries of their forefathers skewering the Catholic hankering for relics, are shown to be roundly hoist by their own petard. Maybe they're not after body parts, like saints' bones, but ostraca, etc, with Hebrew or Greek writing, let alone an ossuary? Different story. Then, along comes the James ossuary to make the story inside a story, and to bring in the fourth "F," of filthy lucre. Long before this incident, Biblical Archaeology Review publisher Herschel Shanks was looked at askance by some for some of the ads his magazine ran and other things that had the possibility of boosting either the trade in illicitly acquired actual archaeological relics, or else a trade in forgeries. Shanks, never a man to shy away from a good controversy, also gets hoist by his own petard. The title is a little broad but entirely true. This tale of faith, greed & forgery revolves around a couple of artifacts that surfaced in 2002: the so-called “James Ossuary” and the “Jehoash Tablet”. The first was international news, as it was touted as the first archaeological evidence of Jesus existence. The James Ossuary is a small limestone box which was used to contain the bones of James, the “brother” of Jesus. The ossuary has an inscription reading “Ya’akov bar Yosef achui Yeshua” (Ja The title is a little broad but entirely true. This tale of faith, greed & forgery revolves around a couple of artifacts that surfaced in 2002: the so-called “James Ossuary” and the “Jehoash Tablet”. The first was international news, as it was touted as the first archaeological evidence of Jesus existence. The James Ossuary is a small limestone box which was used to contain the bones of James, the “brother” of Jesus. The ossuary has an inscription reading “Ya’akov bar Yosef achui Yeshua” (James, son of Joseph, brother of Jesus). The other item, the “Jehoash Tablet” purported to be an artifact dating from the time of and relating to the Temple of Solomon. This would be every bit as important to Jews as the James Ossuary would be to Christians (and probably more so). Very interesting investigation into the "James Ossuary" from Israel that was on exhibition here in Canada at the ROM - and then exposed as a forgery several years later. She covers a lot of ground and characters, and shows how much major religions and churches (particularly god people from the Southern US) influenc Very interesting investigation into the "James Ossuary" from Israel that was on exhibition here in Canada at the ROM - and then exposed as a forgery several years later. She covers a lot of ground and characters, and shows how much major religions and churches (particularly god people from the Southern US) influence archeology with their money and need for "actual" proof of the literal bible. I was also surprised to read about athiest jews (Not quite sure why I was surprised, but I was). This book provides an interesting but complex look at the unsavory world of Holy Land antiquities. It carefully follows the trail of the James ossuary – purported to be that of Jesus’ brother. Like a detective mystery unraveling, this book reveals how the James ossuary and many other antiquities prove to be fakes. Nina Burleigh carefully explores the seedy underworld of this trade. Any antiquity that points to the historical existence of Jesus and/or the ancient kingdom of Israel is valuable bot This book provides an interesting but complex look at the unsavory world of Holy Land antiquities. It carefully follows the trail of the James ossuary – purported to be that of Jesus’ brother. Like a detective mystery unraveling, this book reveals how the James ossuary and many other antiquities prove to be fakes. Nina Burleigh carefully explores the seedy underworld of this trade. Any antiquity that points to the historical existence of Jesus and/or the ancient kingdom of Israel is valuable both monetarily and politically, so penetrating its murky depths proves to be difficult. One always wonders how many layers of deceit and corruption still remain undiscovered. Despite the fact that the author could use a good editor, and that she gets lost wandering around in the middle of the book, still an interesting investigation of religious zealotry, chicanery, questionable scholarship, bumbling officials and police, and greed in search of middle eastern artifacts. An excellent and highly readable investigation into the antiquities trade in the Holy Land. The author does a good job of clearly explaining to readers the intricacies of the trade in the context of the tensions in contemporary Israel. There are a host of dubious but interesting individuals profiled too. Sad to say, this one disappointed me. The subject matter is of great interest so perhaps this book is just poorly edited. It didn't seem to come to any great conclusions, or to reveal as much as I thought it would. It seems there are trials and ligitiation ongoing, and because the setting of the story is the Holy Land, there could be issues preventing the author from revealing more. An interesting and engaging read. After having seen the documentary on the ossuary, ten years ago, I was surprised to read about its apparent forgery. Nina gives enough history and description to keep the narrative moving. Burleigh sheds light on the ultra-seamy side of the antiquities "business" in the Holy Land, focusing on collectors, dealers, law enforcers, and "manufacturers". The book is narrowly focused on one particular artifact, thus providing intense detail on the process, such as it is. Dad really liked this one. Though not very long, it covered not only the story of biblical relic forgeries but also the meddling of American evangelical Christians in all things Holy Land now-a-days. It seemed comprehensive, readable and interesting throughout. Me personally I thought the book was very well written I enjoyed the read. It was very educational In that it was the first book I've read concerning archeology although like other readers agree that it did bounce around a little at least it felt as though it did. Good book about biblical antiquities and forgery. I will search more critically when hearing about "amazing" artifacts being found. The book tended to drag on in places and seemed to be restating the message after I got the point. Overall a good read though. Interesting read on how fundamentalists affect the world outside religion and how antiquities are not always what they seem and can be used for unholy purposes. Sometimes the narrative is hard to follow, but this is the book that I was looking for when I checked out The Bible Unearthed. Too much information without enough background in this subject. I turned it back in without reading the whole book. Nina is an award-winning author and journalist. She has written four books and has been published in the New Yorker, Time, New York and People, among many other journals and rags. She has occasionally shellacked her hair for television, including Good Morning America, Nightline, and various programs on CNN and C-Span, as well as flogged books on NPR and countless radio outlets. The daughter of auth Nina is an award-winning author and journalist. She has written four books and has been published in the New Yorker, Time, New York and People, among many other journals and rags. She has occasionally shellacked her hair for television, including Good Morning America, Nightline, and various programs on CNN and C-Span, as well as flogged books on NPR and countless radio outlets. The daughter of author and artist Robert Burleigh and Berta Burleigh, a teacher who emigrated to the USA from Iraq in the 1950s, Nina was born and educated in the Midwest, has traveled extensively in the Middle East and lived in Italy and France. She covered the Clinton White House for Time and reported and wrote human interest stories at People Magazine from New York. She is an adjunct professor at Columbia Graduate School of Journalism and occasionally vents on the Huffington Post.